The Who turned their mourning into defiant energy in their first concert after the death of their longtime bassist. Four days after the death of bass player John Entwistle, the two surviving members of the British rock band kicked off their previously planned North American tour in front of 18,000 fans at the historic Hollywood Bowl on Monday. While some people debated the propriety of playing so soon after the death, a surprisingly lighthearted Roger Daltrey and Pete Townshend got down to business, grinding out two hours of classic material from three decades' worth of albums. "Tonight, we play for John Entwistle," said vocalist Daltrey, three songs into the set. "He's the true spirit of rock 'n' roll, and he lives on in all the music we play." The first two shows of the group's North American tour were canceled after Entwistle, 57, died in his sleep of an apparent heart attack Thursday in Las Vegas, and his bandmates vowed to continue as a tribute to him. Standing in for Entwistle was Welsh session musician Pino Palladino, who had undergone two intensive days' of rehearsals after the band announced on Friday that its three-month tour would go on as a "tribute...to an irreplaceable friend." Earlier, Townshend said he did not expect Palladino, who has played with Tears for Fears, Eric Clapton and Elton John, to "emulate, parody or copy John Entwistle in any way." "The one request I made was that — at first — he play as loud as he can bear!" the guitarist said in a message posted on his Web site. 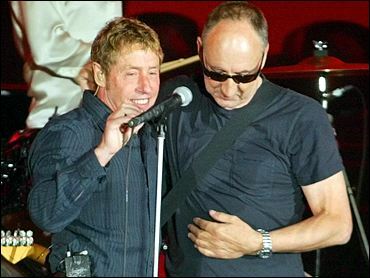 Entwistle, Daltrey and Townshend were three of the founding members of the rock quartet. Drummer Keith Moon died in 1978 of a drug overdose. His place is being taken on the tour by Zak Starkey, son of Ringo Starr. The ensemble is rounded out by keyboardist John "Rabbit" Bundrick, and Townshend's youngest brother, Simon, on acoustic guitar and backing vocals. The group, founded in London in the early 1960s, was part of the British rock invasion along with the Rolling Stones and the Beatles. Their parade of hits included "I Can See For Miles," "Pinball Wizard," and "Won't Get Fooled Again." The Who has been known for explosive shows that often culminate in the smashing of their musical instruments on stage. But Entwistle's bass guitar work was known for its great reserve, anchoring the wild man antics of the other players. Fans at the packed Hollywood Bowl gave the group a standing ovation before a single note was played. Palladino played the first few songs off to the side, often in shadow. Before the set began, giant screens featured video of the group rehearsing at Townshend's home nearly two weeks before Entwistle's death. The audience cheered and applauded each time Entwistle was seen. Many said they were sorry that he was gone, but believe The Who would survive his loss. "The truth of the matter is, Entwistle was very mellow, so he affects the music but he doesn't affect the stage dynamic as much," said Howard Fuchs, 50, a Los Angeles attorney who said he had seen the group perform nearly 20 times. "He was unique and replaceable all in one." Most fans said they were glad the band planned to continue. "I've lost good friends in my life and the best thing you can do to get it out of your system is to express it through music," said Michael May, 39, of Los Angeles, a camera operator and amateur guitarist. The decision to tour provoked disbelief in other quarters. "It's business — and I underline the word 'business' — as usual," a disgusted Jim Ladd, a veteran Los Angeles radio personality, said on his broadcast Monday night. Townshend intimated as much on his Web site last Saturday when he wrote, "I simply believe we have a duty to go on, to ourselves, ticket buyers, staff, promoters, big and little people." Midway through the show, Townshend took the microphone to thank fans for supporting the band during their time of mourning. "We're not just pretending as if nothing happened," Townshend said. "It is difficult." But he said Los Angeles was a great place to kick off the tour, joking that it was "full of emptiness, deep rivers of shallow nothingness." "I think you know, probably more than anybody what the show business side of all this stuff is, and we do feel comfortable to be here tonight." At the end of the show, he and Daltrey embraced and waved farewell to a giant screen beside the stage on which was projected images of Entwistle from his youth to his older days.